Thank you all for coming today. I'd like to say a few words before we start. In one hour it is impossible to cover the whole world of Steadicam so I've had to focus in on some topics and leave others out. What I'm going to do is to briefly talk about the history of the Steadicam then explain how it all goes together and how it works. We'll then go on to see how it's used in TV and films emphasizing the diverse range of shots which can be accomplished. Before you operate Steadicam you need to seek out some form of training in order to be able to safely rig and operate the system. Optex periodically run courses and there is also a week long course run at the Short Course Unit at the National Film School at Beaconsfield. The Steadicam has been around for over 20 years. It was invented by an American called Garrett Brown and was originally to be called 'The Brown Stabiliser'. The systems are not actually manufactured by 'Steadicam' but by an American company called Cinema Products who make them under license from Garrett Brown - in the UK Optex are the sole agents for the system. By today's standards the original Steadicam was quite a crude device and was really an evolving prototype for its first 3 films ('Bound For Glory', 'Rocky' and 'Marathon Man' - which were all released in 1976). Jan Harlan, Stanley Kubrick's production manager, visited the set of Marathon Man while Garret Brown was operating with the Steadicam and was very impressed with the machine. Of course the Steadicam was later used on The Shining, producing some stunning shots. There have been various versions of the Steadicam as it has evolved over the 20 or so years that it's been around. There have been Mark 1, 2, 3 and 3A version's and in the last few years the range has been expanded. There is now an EFP version (for 16mm and video work), an SK (cameras up to 19lbs), a PROVID (for cameras up to 26lbs), a JR (for domestic camcorders) and the new MASTER SERIES, which I'll be using to demonstrate in a minute. The Mark 3 or 3a is probably the rig which most people are familiar with seeing around but they all work on the same principle. In understanding how the Steadicam works, it's useful to talk about the hand held camera and why the pictures from a hand held camera look like they do. The hand held camera is a great device and gives the operator freedom to place the camera dynamically into positions which before were impractical or impossible. The main problem is that it is unstable - it shakes around, giving the 'hand-held look'. This is OK if the 'hand held look' is what you are after but if it isn't it can be very limiting. You can hold pretty good static shots with a hand held camera but when you start to move you are transmitting a lot of the motion from your body to the camera. The Steadicam system is a very elegant solution to this problem. The system is basically in three parts. Firstly we have the sled with the camera mounting platform on top. Not surprisingly, this is where the camera is mounted. The camera is attached to the rest of the sled by a carbon fibre post - down below we have a monitor, battery power and, in between, all the electronics and a detachable 12v/24v converter for when we're powering 24v. film cameras. On the post we have the 'friction less' three axis gimbal about which the sled is free to rotate. What we have done by attaching all these extra sections to the camera is to bring the centre of gravity outside the camera body to a point just below the gimbal so that now we can operate this whole thing about its centre of mass - we've also made it a lot heavier!! The other two parts of the system are the vest which the operator wears to distribute the load as evenly as possible over the body - one size fits all - and then between the camera/sled and the vest goes the articulated sprung arm . Inside each section are three titanium springs which are preloaded to match the particular camera/sled weight. The arm is attached to the vest at one end and to the camera/sled at the other and away you go. We now have a camera which we can effectively operate about its centre of gravity and a camera which is isolated from our body movement by the articulated arm. We are free to pan tilt and roll the camera and boom up and down. We have the freedom of a hand held camera but approaching the smoothness and precision of a dolly. There are no gyroscopes; it's all done with balance. Now that I've got the rig on, it's probably a good time to mention a couple of safety points. By putting a Steadicam on, you make yourself into a very top heavy item. Normally, as you walk along you could trip over a cable or the edge of a carpet or something and recover pretty easily. Not so when wearing this. If you trip, the effect of the sled/arm combination is to accelerate the sled away from you and to drag you into the ground faster than you thought possible. So you have to be especially aware of your surroundings, particularly on uneven ground or slippery surfaces. Ideally you should have someone with you to watch out for you and definitely if you are working on stairs. You should scout the ground (without wearing the rig) where you will be shooting, to check for problems. Also most operators wear knee pads to protect them should they fall. So now that we have the camera with its new found freedom, when do we use it? I think the only answer is; when it's the right tool for the job because that's what it is, another tool. It's important to understand what it can do well and what it really struggles with. When the Steadicam first took off in the early 80's, a lot of the time it was used as an effects camera performing visual 'stunts' which no one had seen before - it was a novelty for the camera to do shots that up until then had been virtually impossible such as wide angle running shots; in through doorways; up stairs etc. The Steadicam has been refined over the years which has expanded the range of shots possible. If you're shooting a sequence in one shot, with no coverage, what you shoot on the day is what you end up with in the final edit. You've done all the editing by choreographing the shot - all the decisions have been made. On the one hand this might seem to be restrictive - locking you into a situation you can't get out of but you have the advantage of seeing it all in front of you in realtime. What you're doing is to produce there and then what you want to appear on the screen. Also, if you're producing a very complicated sequence you'll want more than one good take just in case something happens to the film or tape. A lot of choreography goes into these one shot sequences. The camera movement can be motivated by a variety of things such as carefully timed looks and head turns, extras crossing frame, a glass being handed from one person to another etc. etc. There are the basic mechanical things to consider as the shot is being constructed and supporting artists are essential to weave into the shot and 'fill in the gaps'. What you don't want to end up with is a rambling shot which just goes on and on, has no direction and gets boring. In a traditionally shot scene, you might cut to another camera angle for a close-up or to show some relevant background action - someone coming through a door, say. If you are attempting to do the whole scene on one Steadicam shot you have to devise ways of showing all these things to the audience without the camera motion attracting attention. The camera's movement must also interweave seamlessly into the action. Another thing to consider is that you are asking the actors to perform in a long unbroken take, which can be very demanding, although some actors might feel this method improves their performance. A one shot scene also means that you don't need to worry about continuity within the scene. As a Steadicam operator you are, or should be, very much involved at the sharp end and you should be aware of the possible problems you and you machine could be causing for other people - like how a DOP/Lighting Cameraman is going to light this wonderful 360 degree shot you've just sold to the Director and how the sound department is going to get the boom in to pick up dialogue. You can become very unpopular very quickly if you don't tread carefully! To illustrate an excellent piece of shot-choreography I've chosen a shot from Brian De Palma's 'The Untouchables' which is now 10 years old but is still one of the best Steadicam sequences around. Of course not all Steadicam shots are big feature film set pieces. Steadicam is used day to day on many productions where it is less visible. It is not the function of the Steadicam to appear 'flashy' (although it does!). It's there to do a job just like every other piece of camera equipment and it can be used for a variety of reasons. It maybe that you have to get a certain number of setups in a limited amount of time because of light, access to a building or area, or for financial restrictions. Steadicam gets used a great deal on corporate shoots because the production value it can add is very cost effective. It can also be used to give the operator back ache - it does that very well! As a contrast to the sequences we've just seen, here are a couple of things I did last year. The first is a compilation from a six part drama series shot in North Wales last summer on widescreen Digi-Beta. It was all shot on location in and around a small village - most of the interiors were very small and there was no way we could get tracks in the interiors so the production decided that all the moving shots, interior and exterior, would be shot on Steadicam . This was quite a challenge for me as an operator because not only was I doing the Steadicam shots but also all the dolly shots as well. The next shot is from a feature called Chameleon. Again it's a fairly subtle shot - not obviously Steadicam - although it would have been complicated to execute on a dolly because the camera snakes in at the end to emphasise the shadow on the wall. Also the previous setup to this was a wide shot which showed all the frontage of the houses and so we would have had to wait for the track to be laid and the dolly/arm to be rigged. As it was, we got the shot in about 20 to 25 minutes. The last sequence on this tape is a series of shots from Harvest Moon (aka Drover's Gold) a BBC period drama which I believe gets released in the next few months. We were shooting in Frome over three or four days and once again there were a lot of setups to get in the can. The shot is locked off at the start, then as our characters come closer to camera, we pull back with them maintaining the 2/s. There were 100 head of cattle coming up behind our actors, so there is no way we could have achieved this on tracks. It is important as an operator to be able to hold a static frame at the end, or in this case in the middle, of a shot so that there is a clean point for the editor to cut into the reverse. These pictures are recorded from video assist. When shooting on film, a tiny video camera points down the camera eyepiece and you take the video-out to feed to the Steadicam monitor. These video assist cameras vary considerably and it can sometimes be quite a battle to get a usable picture out of them - whereas, of course, when shooting on video, you get a nice broadcast quality picture. With film shoots it's become common practise to record the shot onto 8mm tape for instant playback - using a portable recorder. It's much more reassuring as an operator to have playback because you cannot always have you eyes on the monitor; sometimes you have to glance away from the screen and that could have been the point at which someone's eye caught the lens or you shot a light in the corner of the frame. Another thing which becomes less straight forward with Steadicam is focusing. When you're wearing the rig you've got your hands full so you need someone to focus for you but because of the fine balance of the system it's impossible to focus without disturbing the shot, so we use a remote focus unit radioed to motors on the lens. The handset wheel is marked up as per the lens - the focus puller can now pull focus remotely. There is also a facility for a second lens control, so you can pull the iris or zoom, and a camera start/stop switch. The balance of the rig and therefore the steadiness or the shot can also be upset by the wind. A blustery wind is the worst; it's like someone pushing the camera as you try to hold it still. The simplest way to overcome this is to get someone to flag the wind off the rig using a 4X4. If the wind is heading straight down the lens, obviously he can't do that or he'd be in shot, so it's a matter of getting two boards and forming a 'V' behind you, to stagnate the flow. Most of the shots I've shown up to now have been shot at normal eye level. That's where most of our own POV's in life come from. With Steadicam, if you want to shoot lower than about waist level you have to rig the camera in what is called 'Low Mode', that is, with the camera still mounted on the camera mounting platform but attached by its handle, using a 'Low Mode' bracket, so that it is upside down. The monitor is flipped the other way up too, so that when the whole rig is flipped over, the camera is on the bottom, under-slung. 'Low Mode' is great for shooting with children and animals. The downside to 'Low Mode' is that it is much more tiring than 'Hi Mode' because you're distorting your body more and the normal rest positions no longer work. On the other end of the height spectrum there are Steadicam crane shots. There are obviously safety implications with crane shots - you need to be secured safely when you're at height but still be able to be released quickly when you reach the ground. As far as the shot is concerned, the trick is to conceal the transition between being on and off the crane platform. You do this using the arm to continue the downward motion as the crane stops at the ground and you step off the platform. The technique is reversed for stepping onto a platform to crane up. The next clip on tape is a crane shot from 'One from the heart (1982). The Steadicam operator was Garrett Brown and it's followed by a rather interesting shot from 'Parenthood' (1989) which is like a mini crane shot. It's very subtle and you hardly notice it's happening. As the two actresses walk out onto the porch the camera is preceding them and the operator steps off the top step, onto a wooden door affair which is being carried five feet off the ground by a bunch of guys. They track him along and then crane him down back to eye level. Question: For someone who has a good sense of balance and spatial awareness, how long would it take to become proficient and would practicing with the JR Steadicam shorten this time? Answer: Using a JR probably wouldn't help much, if at all. What your brain is doing when you're wearing a Steadicam is learning a whole new way of balancing. How long does it take to learn to drive a car? - different people show different aptitudes and will pick it up faster than others. The courses that are run in the UK by Optex in New Barnet and the Short Course Unit at the National Film School in Beaconsfield are essentially just an introduction to Steadicam. Even at the end of the 5 day course at Beaconsfield you realise that you are still just beginning. Question: Are there any exercises that you do to build up your back muscles? Answer: Not specifically. People expect you as a Steadicam operator to be a foot taller and a foot wider than I am, which is one of the myths; above all you've got to be fit and have stamina more than anything else. It's good to do the general fitness exercises such as swimming, cycling and hill walking. Question: Do you find that resting up against a tree or a pole (or something!) takes the weight off you and allows you to rest? Answer: No. The best way to rest is to dock the rig back onto the stand. I was always taught that if you're not looking at the monitor then switch it off to save battery power and if the monitor's off then you might as well put the rig back on the stand! It's easy to fall into the trap of chatting to the director or whoever while you're wearing the rig and wearing yourself out for no reason. There are two problems with the weight of the Steadicam:- 1: It's heavy and 2: It doesn't look heavy. However much the director is aware of the weight at the beginning of the day, he'll soon forget when he sees the thing 'floating' around by your side. Question: What's your time limit - how long would you wear it for? Answer: As little as possible. It's good to practice with a lighter cameras but if you're shooting 35mm you can be easily carrying 70 to 75lbs. The sensible thing to do is to sort out most of the problems with the shot by blocking it out before you put the rig on. Question: Would the focus puller have a monitor to focus by? Answer: Not usually. The Steadicam monitors are much sharper than they used to be, so on video maybe he could look over the shoulder of the operator to judge focus but more often than not (and always on film) he'll go off marks on the remote focus unit which will have been calibrated to the lens being used. Question: Is there an optimum lens angle to be used with Steadicam or is it a case of 'the wider the better'? Answer: If you're on a wide angle, it makes focusing easier and makes the move more dramatic but you see more of the horizon which could be a problem if your horizontal level is slightly out. On a tighter lens it 'feels' much more like a dolly shot, more precise and of course you see less of the horizon. Tighter lenses force you to be more precise with your operating especially starting the shot static and stopping with a 'lock off'. Question: If you want to find out more about Steadicam, how would you go about it? Answer: I would suggest that the best way to learn more is to go on a course. Even if you don't eventually end up as an operator; it's a good education. Learning about Steadicam is a very practical thing - there is only so much you can learn by watching and talking about it before you need to put it on and try it out. Question: How long did it take you to become a competent Steadicam operator? Answer: Until this morning! You're always learning and there's always something just around the corner which you didn't expect to have to do. I suppose that after a couple of months you can do the easy things fairly well but I think it's healthy to always be self critical so that you keep learning and improving. Question: Does Steadicam get used a lot on documentaries? Answer: I think there are some barriers to the use of Steadicam. Documentaries can be very personal affairs and I think the use of Steadicam could be intrusive. Also time would have to be allowed for the rigging of the system. I don't think there's an inherent reason why it can't be used; it's down to personal taste. On the last documentary I did, Steadicam was used to great effect by the director (The Vanishing of Richie Manic, Channel 4 - director Stuart Clarke). Question: What do you do about recording sound? Answer: On video, if you're recording effects only you might get away with the camera mic. It is possible to plug lightweight cables into the back of the Betacam in the normal way but this restricts the mobility and running cables across the 'friction less' gimbal is always a compromise to the balance of the rig. The best option is to record onto DAT or to use radio mics. to radio the sound from the mixer to the Betacam. Question: Will technology overtake Steadicam and make today's models obsolete? Answer: I don't think so; the Steadicams from 15 years ago are still going strong. The Master Series Steadicam of today might look very different but it is still based on the same physical principals of balance and mass distribution. Question: How much work is out there for Steadicam operators? John Wards feature film credits include Highlander (1986), Full Metal Jacket, Death Machine (1995), Jack and Sarah (1995), Restoration (1995) and The Fifth Element (1995). For his full credits see John Wards Internet Movie Database entry. I talked to John on several occasions in November of 1997 about his involvement with the film company. Q: I’m trying to find out more about the Steadicams used as futuristic gun mounts in the 1986 movie Aliens, can you help? JW: It was 1985 and they were rented from me. Q: Around this time were you known as John Ward Films or were you a one man band? JW: Well (laughs), its always been me, and I’ve always been known as Ward Films. Q: I’ve heard from Peter Cavaciuti that you started work on the movie but moved onto Kubrick’s Full Metal Jacket, what scenes did you shoot? JW: I was never hired for Aliens since I was already scheduled for Full Metal. The other guy on Aliens was Jan Pester. What happened was one day I got this phone call out of the blue, it was handed to me and they said there’s somebody called James Cameron on the phone (laughs), somebody I said, there’s only one James Cameron! His wife was running things at that time, I think she produced it. Anyway, I get to the phone and there’s Jim Cameron, saying that he wanted to know what I thought about putting a machine gun on a steadicam...I think I talked to him twice about it, I went down to Pinewood to visit the sets. Q: What was the make and model of the Steadicam which you hired (used by Vasquez and Drake), how many did you hire, and did you hire directly to the production? JW: They were Cinema Products Mk III arms and vests. I hired them directly to the Aliens production. One was, I think number 325, the other was 286. I ended up taking them to Bapty, I put the steadicam on and this guy placed the gun on the arm...they ended up having to put more weight on since it didn’t balance, they took some photographs of me in the get-up but I never got to see them. Q: Thats a shame, I’ve seen photos on the construction of the smaller gun, but never any of the Smartgun. When they were returned did they come back in as good a condition as you hired them? JW: No, they didn’t, one was o.k. but the actress was too small for hers so they had to cut it down, they compensated me for it later. I remember that they both had light weight arms (Steadicam arms). 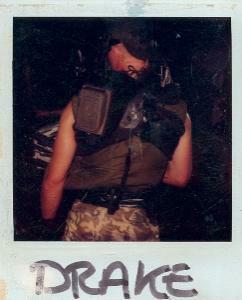 Q: What happened to the rigs after Aliens, are they still used for shooting movies today? JW: I have sold them both, one complete rig (286=Drake) went to Vince McGahon in York, the arm off the other went to Channel 5 News, while the vest was so badly damaged that it was unusable. I think the pads went to Nigel Curtain, I think he still has the plate. Q: Thanks for your time John. JW: No problem, its been a pleasure. Portions of this interview were edited for clarity. 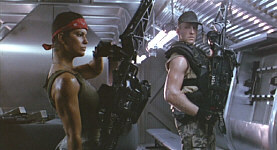 Notes on the Mk III Steadicam and its use in Aliens: The M-56 Smartguns in Aliens are described in the script as ‘Guns fixed to a floating body harness and targeted by thermal gun sights mounted within the operators helmet. They were composed of a German Spandau M-42 Sub-Machine gun fixed to a modified steadicam harness. The M-42 was chosen for its large muzzle flash and minimum smoke. The guns were designed by Jim Cameron and were put together by Bapty, the leading supplier of firearms to the UK film industry. Two Mk III Steadicam harnesses were rented from John Ward and extra weight added to balance them since the guns were lighter than a standard camera , Terry Reed made the IR sights, lights and front plates at Pinewood Studios Below are some notes I have composed on the Mk III. Although the model 3A is no longer manufactured, it is readily available on the used market. Right now used model 3A’s are in the neighbourhood of $27,000-29,000. Camera Operators Vest: The comfortable and adjustable, padded close fitting, breakaway vest, is an effective and sophisticated weight distribution system which efficiently transfers and distributes the weight of the steadicam system across the operator’s shoulders, back and hips. A parachute-type pin and cone quick release system is a reliable safety measure. The vest pad, made of washable cotton polyester and featuring velcro backing for easy removal, offer added ventilation and comfort.